On the tenth of March we once again waged an attack on the village of Cruz bay, at the Inn at Tamarind Court. We were mightily joined by the fairest of maidens, Cat Braaten, who harmonized magically and sang the Shanty “No Stoplights in this Town, Penned by the honorable Allan MacPhee, also in attendance. The following morning we made a stealthy getaway, boarding a frigate bound for St Thomas. We returned the skiff we had used to navigate the islands, and boarded the most amazing vessel, a sloop which gave one the impression of FLYING over the ocean. Why, even when approaching the Island of St Croix, our destination, I could swear I saw the village of Frederiksted from above, as if I were a bird! Perhaps I had fallen asleep during the journey and had this fanciful dream, but the other Blue Buccaneers amazingly shared this hallucination! After securing lodging at the picturesque and most comfortable Jasmine Manor in Frederiksted, a villa operated by the wondrous hostess and Yoga instructor Vicky Pederson, (though I’m still unclear of what “Yoga” is; something from the orient, no doubt. ), we made our way to Cheeseburgers in Paradise, east of Christiansted. 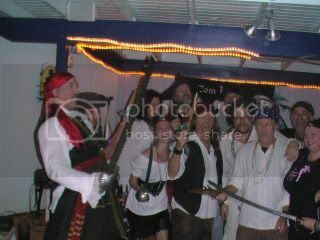 After performing for about an hour we were visited by the most wonderful group of pirates, including Michael “Captain Kelly” Belcheff (see last year’s tour log) and the revolutionary John “Ol Chumbucket” Baur, the creator of “Talk Like a Pirate Day”. The carousing was great, and the lovely Tess managed to plunder copious doubloons from the patrons. Ol Chumbucket even wrote a missive about us for a paperless journal (http://stcroixsource.com/content/arts-entertainment/2011/03/01/buccaneer-band-bringing-pirate-music-vi). March 13th: we find ourselves readying for an attack in Rainbow Beach this afternoon, perhaps our most dangerous of the entire tour.